Provided you already own the base game. The free trial forms part of Paradox’s “monthly expansion highlight”, in which the studio picks an expansion and lets people try it out for free. It’s a slightly unusual approach to offering players a bit of free content, but Paradox’s reasoning on their forum is straightforward. “We want to give people the opportunity to try out some content they might not own before buying it!” Fair enough. As for what exactly you get, Mandate of Heaven is primarily focussed around playing as an East Asian power. 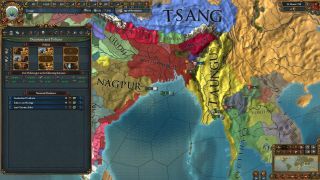 It includes new mechanics for states such as Ming China, like imperial decrees and Imperial reforms. Meanwhile, new rules for Japan mean that Daimyos owe loyalty to their Shogun, which is whoever controls Kyoto. Hence, if you’re the Shogun, you can lean on your rival’s honour to force them to commit seppuku. Charming! You can currently pick the expansion up on Steam for £18.52, which is a 10 percent discount. That...still seems like a lot, although ultimately I suppose it depends on how much you want to make your rivals commit seppuku.